For many low income households, energy costs place a severe and continuing stress on the family's budget. In some instances the household is forced to make painful decisions regarding which bills to pay and which necessities to survive without. The Low Income Home Energy Assistance Program (LIHEAP) is designed to assist eligible low-income households pay for winter energy services and or cooling needs in the summer. 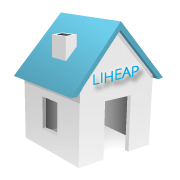 LIHEAP will provide a one-time benefit to eligible households to be used for energy bills. The amount of payment is determined by income, household size, fuel type, and geographic location. Funding for the program is provided by the US Department of Health and Human Services. You can also make or cancel an appointment at any time (24/7) using our automated phone system by dialing Toll-free 877-246-7836 and following the instructions. To apply and receive assistance, customers "must" bring all required documentation and when applicable eligibility is determined by the federal poverty guidelines. The above information should be obtained for every member of the household. The information listed above represent minimum requirements for assistance and does not cover all required data. All applicants are encouraged to call for detailed requirements and available appointments.